Keep birds away with these simple vinyl ball visual deterrents that move with the wind & intimidate pest birds within visible range. 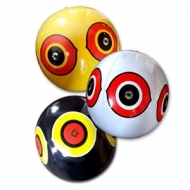 Scare Eye® balloons are useful in many applications – homes, gardens, barns, trees, garages, marinas, doorways, & many more. Holographic bird tape flashes blinding light & makes noise when it flaps in the wind. Irri-Tape® is a multi-sensory attack scares birds away from the treated area. 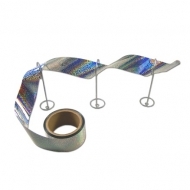 Also known as Flash Tape, Foil Tape, Bird Tape, Repeller Ribbon, Mirror Tape, Reflective Tape, Mylar Tape, Holographic Tape, & many others, this product has been used for years.